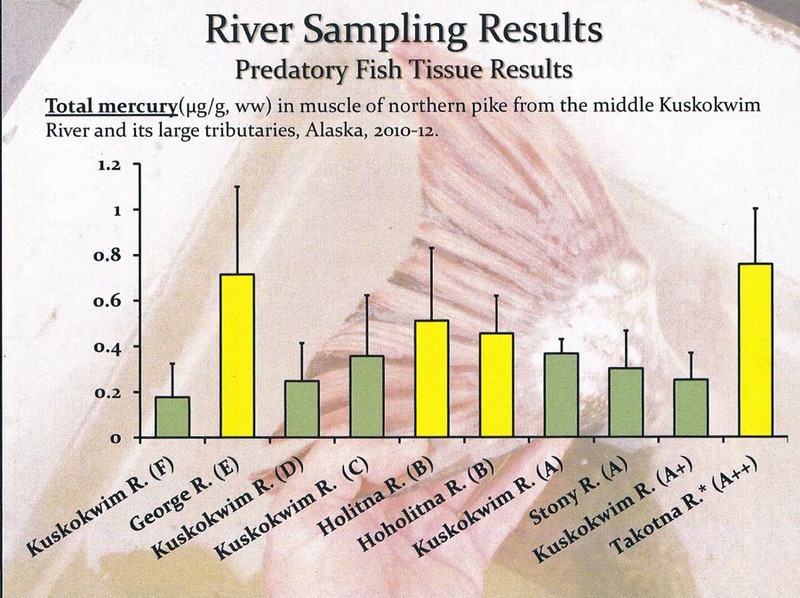 There were numerous good presentations at this year’s Forum on the Environment, but none that hit home like those that featured contaminant levels of mercury in pike and lush (i.e., burbot) and associated fish consumption advisories for the middle Kuskokwim River. It was noted that we live in a highly mineralized area known as the mineral belt where roughly 70 % of all known mercury deposits within the state occur. For this reason, the region is also known as the mercury belt, so naturally occurring mercury is quite common. Mercury can enter the environment from such natural events as volcanoes and forest fires while it’s thought that relatively large reserves of mercury in the permafrost are being released as the permafrost continues to melt due to the influences of climate change. However, one human related source of mercury is atmospheric deposition, most of which originates from the coal-fired power plants in Asia that spew out vast amounts of sulfur dioxide, nitrogen oxides and mercury into the air that are then transported long distances via the air currents. Another human derived source, the abandoned Red Devil Mine that operated between 1933 and 1971, has generated lots of interest over the years because of its potential for releasing substantial levels of mercury into our surroundings. Although some remediation has been accomplished, a thorough cleanup is necessary and the Bureau of Land Management is considering the options. At one time the mine was the largest producer of mercury in Alaska and one of the largest in the U.S. Having that distinction, it’s not surprising then that it could wind up being what’s considered a Superfund Site, which are highly contaminated sites of national significance. Not only is the immediate area peppered with potentially toxic mercury, but unknown amounts are currently migrating into the Kuskokwim River and winding up in the streambed sediments and contaminating fishes and other organisms. There are several forms of mercury and the one of concern to human health, methyl mercury, is converted into its harmful stage by methylating bacteria generally found in water, river and lake sediments and wetlands. Fish and insects acquire methyl mercury primarily through their diets (insects eat the algae that contains mercury and fish eat the insects). Methyl mercury is not easily excreted and builds up in their bodies (i.e., bioaccumulates)…and in the bodies of those bigger things further up the food chain that consume smaller things below them. In order to determine the level of concern on human health, the BLM, along with ADF&G, the Fish & Wildlife Service and KNA, conducted several studies regarding lush, pike, grayling, Dolly Varden and slimy sculpin in the immediate Red Devil area as well as further upstream beyond McGrath and downriver near Aniak. In certain tributary streams, insects were also sampled because they inhabit the channel substrates and are a major food source for juvenile as well as adult fishes. The study involved measuring the amount of mercury in fish muscle tissue as well as documenting the movement patterns of many of the fishes that are important subsistence food items. Since 2010 over 1,200 fish were collected and analyzed for heavy metal concentrations and between 2010 and 2011 radio transmitters were surgically implanted in 154 lush, 245 northern pike and 170 grayling; over time, their movements were tracked throughout the Kuskokwim drainage for up to two years. Many of the lush that were implanted with transmitters spent the winter up near McGrath (a few stayed in the vicinity of the Swift and Stony Rivers) and the summers between Aniak and the mouth of the Kuskokwim (a few were observed between Crooked Cr. and Sleetmute). Some lush were tracked going from McGrath to below Eek in only a matter of a few weeks; so they move long distances in a relatively short period. Interestingly, the lush sampled in the summer had higher concentrations of mercury compared to those sampled in the winter. Why would that be? 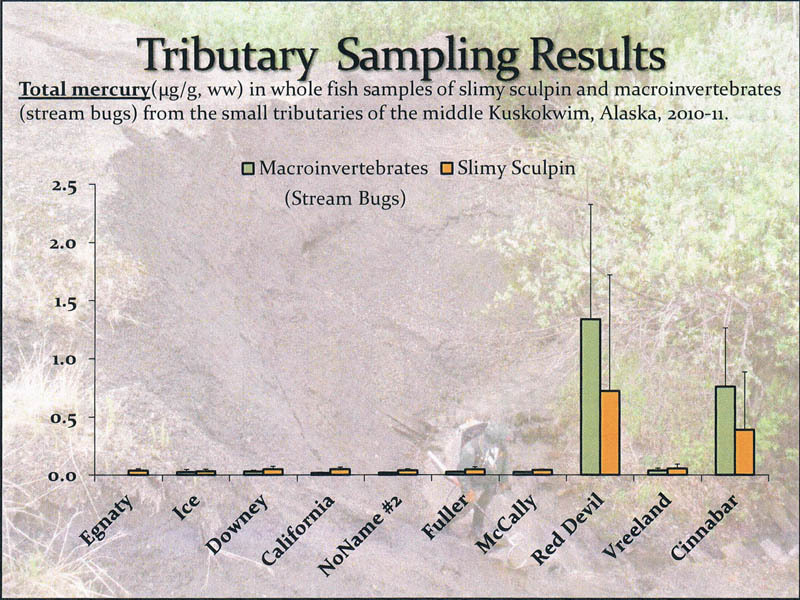 The majority of lush that were sampled in the summer were mostly resident fish from the middle river (the non-resident fish were already downstream of Aniak at that time), which would be more likely to have bioaccumulated the mercury since the middle Kuskokwim is where the heavy metals are concentrated. Not linked to any Red Devil Mine influence, the greatest concentrations of mercury in pike were found in the Holitna and George River drainages. There are several known outcrops of cinnabar in the George River while Cinnabar Creek, a tributary of the Holitna, has had mining activity and is believed to be a source of mercury in that drainage. The pike from the George River were found to have the highest concentrations of mercury of any pike in the Kuskokwim drainage. The majority of George River pike implanted with transmitters in the summer stayed throughout the winter, except for a few that went downstream in the Kuskokwim toward Crooked Creek, several that went up the Holitna and a few that went up near Sleetmute. Since these fish pretty much stay put in the George River, which naturally has high levels of mercury, it only stands to reason that they could have the highest concentration of any in the Kuskokwim. The majority of pike tagged in the Holitna and Hoholitna stayed there throughout the winter, and a good portion of pike tagged between Sleetmute and Stony River during the summer moved into the Holitna for the winter. As might be expected, other heavy metals like arsenic was also found in elevated levels in small fish in streams adjacent to previously mined areas. 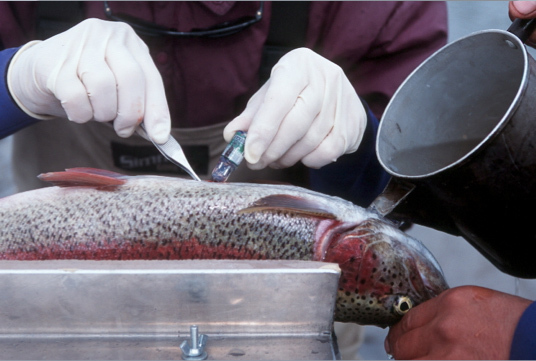 Being known active point sources of contaminants, juvenile Dolly Varden and slimy sculpin from Red Devil and Cinnabar Creeks had concentrations of mercury that exceeded harmful levels. How does mercury affect us? Mercury at toxic levels can damage the brain and nervous system, with young children and unborn babies the most susceptible because their systems are still developing. The result can be learning and behavioral problems, lowered IQ, seizures, vision and hearing loss, delayed development and memory loss. Those guidelines recommend that women of child-bearing age (between 15 and 45), nursing mothers, and children 12 years and under limit their intake of pike (particularly dried pike) and lush from the middle Kuskokwim. Since 2002 the State has had a Hair Mercury Biomonitoring Program in which women of child-bearing age can find out what their mercury levels are, just by sending in a small hair sample…and it’s FREE! Results generally come back within a month; if you have any questions you can call Nim Ha at 269-8028. Having said all that – fish are still one of the best sources of nutrition and an excellent choice for a healthy diet. The State’s guidelines give the following recommendations to maintain a healthy diet while reducing your mercury intake: Eat a variety of fish, eat smaller pike and lush more often and larger fish and dried fish less often. Because salmon are not resident species and not exposed to heavy metals for any length of time, there are no advisories for the consumption of salmon.